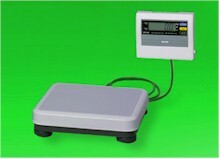 Economical electronic scale with large capacity, tare function. Easy to read 1" display. Keys on front panel for ON/OFF, KG/LB. AC adapter included. (6) size AA batteries (not included). Batteries last approximately 200 hours. 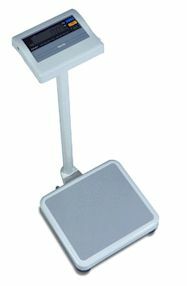 Platform 12" x 13.25" x 3-1/8" H. Overall 11-7/8" x 13.25" x 28-7/8" H. Weight 17 lb. Dimensions: W 13.25" x D 11.8" x H 3.12"